Antique - Allerton's China of Longport, England in the Multi-color Opalescent, Lustreware, Made from 1890 to 1942. 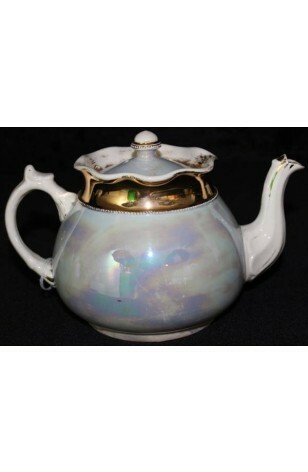 This Beautiful Antique/Vintage Opalescent Lustreware Teapot and Lid, by Allerton's China of Longport, England is a Highly Decorated in 22kt Gold below the Rim of the Teapot, and has Bands of Beads around the 22kt Gold, and Knob of Lid. There is a 22kt Gold Decoration on the Spout and Handle. Teapot has a small foot. A Truly Lovely Antique/Vintage Item to have decorating your home. Some slight age cracking, naturally due to its age. Otherwise the condition is great. This Beautiful Antique/Vintage Opalescent Lustreware Teapot and Lid, by Allerton's China of Longport, England is a Highly Decorated in 22kt Gold below the Rim of the Teapot, and has Bands of Beads around the 22kt Gold, and Knob of Lid. There is a 22kt Gold Decoration on the Spout and Handle. Teapot has a small foot. A Truly Lovely Antique/Vintage Item to have decorating your home. Some slight age cracking, naturally due to its age. Otherwise is in Very Good Resale Condition.